American ambassador condemns firing of rocket from Gaza on central Israeli town which left seven injured. The United States on Monday condemned a rocket attack from the Hamas-ruled Gaza Strip on central Israel that left seven people injured and levelled a private home. US Ambassador to Israel David Friedman said Monday afternoon that the US was “outraged” by the attack, holding the Hamas terrorist organization responsible. “Outraged to hear of another Hamas rocket attack aimed at Israeli civilians. 7 people were wounded, including a 3 year old and a 6 month old. We condemn this act of violence and hope for a speedy recovery for the injured,” Friedman tweeted. The rocket attack early Monday morning struck deep inside Israeli territory, landing in the Sharon region of central Israel, some 50 miles from the Gaza Strip and 75 miles from the estimated launch site in Rafah in southern Gaza. 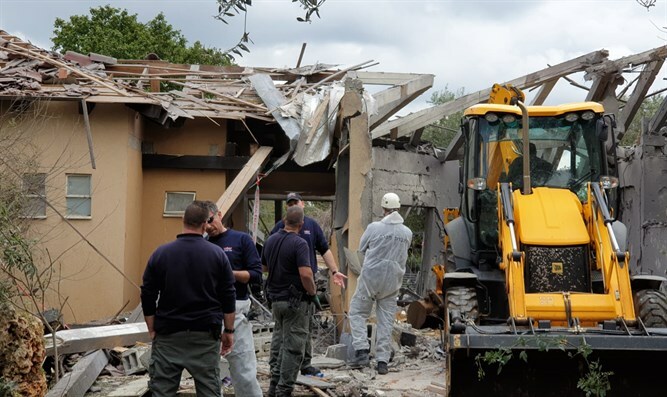 A private home in the town of Mishmeret was struck by the rocket, which levelled the building and left seven people injured, including two women listed in moderate condition. The attack prompted Prime Minister Binyamin Netanyahu to cut short his visit to Washington and return early, forcing him to cancel a planned appearance at the annual AIPAC conference. I n addition, the IDF announced that it was increasing its presence on the Gaza front following the rocket launch.